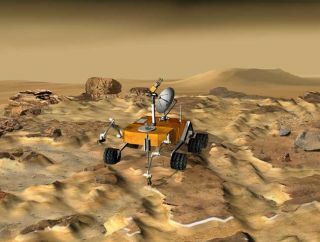 NASA Mars exploration program is planning for various future Mars missions. Shown here is the astrobiology field laboratory that would conduct a robotic search for life. In the ongoing quest for extraterrestrial life, imagine theday scientists discover life on another planet. Then imagine finding out thatthose life forms actually originated on Earth. With every spacecraft that leaves Earth, millions ofmicrobes try to hitch a rideinto outer space. NASA hopes to launch a Mars Sample Return Mission in thefuture, and preventing cross-contamination of Mars and the Earth in such amission would be a top priority.? A paper published in the September issue of Trendsin Microbiology takes a look at NASA?s current planetary protectionpolicies and procedures. ?If terrestrial bugs makeit to Mars can they survive and grow, or would they be able to thrive inextreme environments?? asks lead author of the paper Wayne Nicholson, who is aprofessor at the Department of Microbiology & Cell Science at the University of Florida, Kennedy Space Center. "So far, our results show that they wouldn'tbe able to grow.? Even so, NASA?s planetary protection program is working toimprove procedures to make sure hitchhiker microbes traveling on robotic orcrewed vehicles don?t contaminatenew worlds. Of primary concern is ?back contamination,? or the transferringof extraterrestrial life forms back to Earth where they could harm thebiosphere. ?Forward contamination? is when microbes from the Earth gettransported on outbound spacecraft to other planetary bodies, potentiallycolonizing those environments. ?The highest priority is to prevent contamination of theEarth,? says Catharine Conley, NASA?s planetary protection officer. ?We havenever brought samples back from places where we think (life could exist). Sofrom a practical point, we are concerned with forward contamination.? Back contamination was the main concern when the planetaryprotection program first began. After the Soviet Union commenced spaceexploration with the launching of the first Earth satellite Sputnik in 1957,the International Council for Science established the Committee on SpaceResearch (COSPAR) to promote international space research. One of itsresponsibilities was the planetary protection program. The 1967 Outer Space Treaty formally outlined global guidelinesfor any nation engaging in space exploration. It stated that any activities inouter space, including the moon and other planetary bodies, must be carried outin a manner that avoidsbiological contamination. Though the scientific community is expected to actresponsibly in exploring new frontiers, Larry Esposito, professor ofastrophysical and planetary sciences at the University of Colorado, Boulder, feels that back contamination is ultimately more important. ?The greatest dangers are back contamination even though theprobability might be lower,? says Esposito. ?The fact is that we're living onthe Earth and determining our livelihoods, and we're part of the ecological(system), which could potentially be affected by back contamination.? In recent times, forward contamination also has become apriority, particularly with the exploration of Mars and the potential forfinding life there. In March of this year, astronauts on the International SpaceStation conducted the LOCAD-PTS Exploration experiment, the first test ofplanetary protection technology. This involved swabbing the astronauts? gloveswith a high-tech Q-tip and testing that Q-tip for microbes. The astronautsfound almost no bacteria but they found glucan, a marker for fungi, at 15sites. The protection procedures are determined by two factors: thetype of mission (flyby, orbiter, lander or rover) and how likely thedestination is to harbor life. A mission can fall into one of five categories,with Category V consisting of ?return to Earth? missions. Once the mission iscategorized, NASA uses a variety of procedures to reducemicrobial material on spacecrafts. All procedures take place in cleanrooms, designed with special air-flow systems to filter out contaminants. Prior to cleaning, scientists sample the number of spores onthe spacecraft. Sterile cotton swabs are used to sample areas on the spacecraftto obtain microbial samples. The collected samples are incubated to cultivatespore colonies, and using complex algorithms, scientists then calculate thetotal level of contamination. NASA?s current method for spacecraft sterilization is aprocess called dry heat microbial reduction. It involves cleaning thespacecraft and then baking it in an oven at 233 degrees Fahrenheit (112 degreesCelsius) for 30 hours. It?s the same process that was used on the Viking Marslanders in 1970s. Conley says the cleaning reduces the initial 300 spores persquare meter to 0.03 spores per square meter. Statistically, since 0.03 doesn?tconsist of a whole spore, the spacecraft is deemed safe from microbialcontamination. NASA expects future missions to require more stringentcleaning measures and is considering two particular methods for use in the nearfuture. One method - the Limulus Amebocyte Lysate (LAL) assay -searches for the presence of microbial cell wall materials. A method originallyused in the pharmaceutical industry, this has the advantage of being highlysensitive, fast and reactive to both live and dead organisms. The second method - Adenosine Triphosphate (ATP) assay -detects ATP, which is an essential energy source generated by all living cells.This method, too, detects both live and dead cells so it is a good indicationof biological contamination. Even with the rigorous cleaning procedures currently inplace, millions of microbes still get launched from Earth.? How can scientistsbe certain that any life found on another planetary body is not a resultof contamination? ?When searching for life, we don't want to have a falsepositive,? explains Esposito. ?That would confuse identification of life onanother planet or location.? For identification of potential alien life, NASA has aninventory of samples collected on previous missions (like Viking) to which newlife forms can be compared. Conley says current DNA-based testing methods allowscientists to rule out the possibility that extraterrestrial life forms did notoriginate on Earth.? This means that scientists expect alien life to have DNA differentfrom any known organism on Earth (if they have DNA at all). As astrobiologists continue the search for life in otherworlds, safeguarding the environment here on Earth and elsewhere in theuniverse remains a key priority. ?We're concerned about life everywhere, and we don't want topollute or invade other locations with Earth life,? says Esposito. ?In the sameway, we don't want to infect life on Earth with species from other planets. ?